Kibitzing and blitzing are two nicest things to do on KGS. 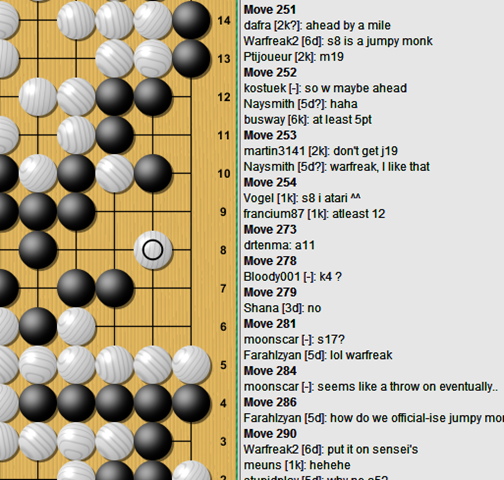 Today I witnessed the creation of a new KGS Go term during a game between ecstatic[9d] and supertjc[8d]. FarahIzyan[5d] asked about the Go term for S8 move below, whether it should also be called “monkey jump”. Originally, monkey jump means a large knight jump on the first line from a second line, a very useful reduction technique for endgame. 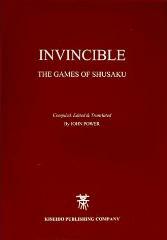 It already has its own entry in Sensei’s Library. You may also visit an earlier entry on Sensei’s about Inverse Monkey Jump which talked about the same move.